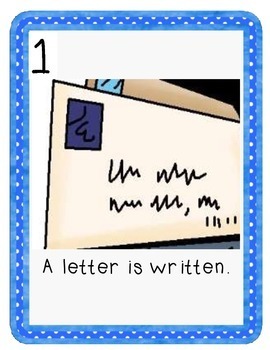 This is the perfect way to teach your students how a letter gets from the sender to its recipient. 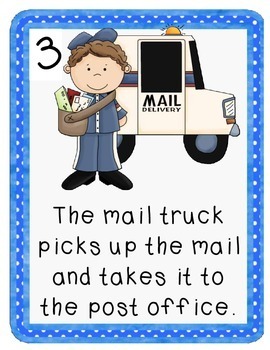 This adorable set includes full-color, kid-friendly graphics to illustrate the mail process, along with written descriptions. 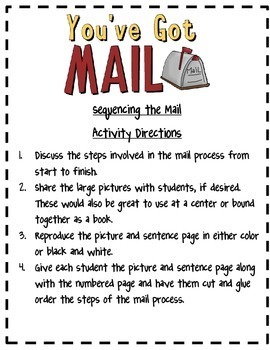 There are five full pages, each depicting a step in the mail process There is also a cut and paste worksheet included to assess students' understanding. 1. 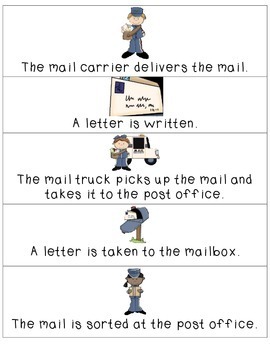 Discuss the steps involved in the mail process from start to finish. 2. Share the large pictures with students, if desired. These would also be great to use at a center or bound together as a book. 3. Reproduce the picture and sentence page in either color or black and white. 4. Give each student the picture and sentence page along with the numbered page and have them cut and glue order the steps of the mail process.